Custom Woodworking Products: O.B. Williams Company provides the best value available in quality Custom Woodworking Products, services and customer satisfaction. The thousands of moulding samples in our display room are a valuable hands-on design resource for you. O.B. 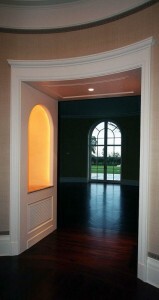 Williams Company is an excellent and cost effective resource for top quality custom wood mouldings and millwork. All mouldings are made to order and all can be made from virtually any species of wood. O.B. Williams Company designs and manufactures custom wood windows and doors in virtually any species of wood, in special sizes and thicknesses, and at any level of complexity. As a custom manufacturer, O.B. Williams Company is able to adapt to customer requirements with relatively few design limitations. Our custom cabinets are meticulously engineered and fabricated by O.B. Williams Company’s seasoned and experienced craftsmen using vast industry insight, state-of-the-art facilities and innovative engineering solutions to deliver high-quality custom cabinets. O.B. Williams Company designs and manufactures custom architectural wood paneled walls and ceilings, box beams, wainscot, and curved (radius) paneling of all descriptions. Paneling installations are provided for high-end residences, luxury hotels, upscale restaurants, commercial building lobbies and elegant tenant spaces. - We offer by-the-hour sanding appointments, custom milling of customer-supplied materials and we often run small orders to match a customer’s existing or historic mouldings. Our friendly over the counter team can assist you no matter how large or small your millwork needs are.